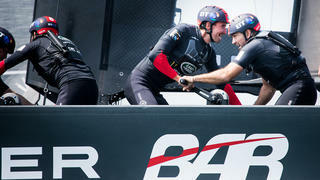 There’s a perception that most of the new America’s Cup sailors do nothing but grind. The absence of the big, set-piece, choreographed manoeuvres — such as setting, dowsing and gybing spinnakers with 16-man crews — has led some to believe that the modern Cup sailor has little to do except wind on the handles. 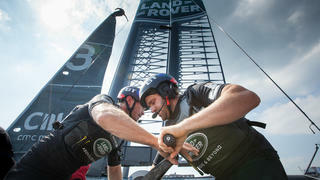 But it’s the physical demands of winding on the handles that now puts these sailors into the same league as world-class endurance athletes and news stories about foiling tacks have shown how critical technique is throughout the crew. The now-stated goal of Cup teams going into next summer’s racing is to keep the boat on its foils or “flying” right around the race track – and this starts with solid straight-line technique. 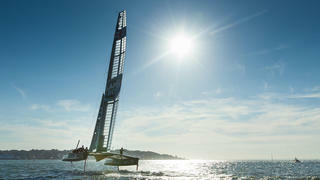 The boat’s foils use the same technology as an aircraft wing and just as a wing lifts a plane off the ground, the wings — or aerofoils — of an America’s Cup boat lift it out of the water. The main wingsail works in the same way as an aircraft wing except it’s rotated to stand up straight, rather than lie flat. The harder the wind blows, the more force it makes for the wing to push the boat forward. When the boat is going fast enough, the hydrofoils can create enough force to lift the boat out of the water. But we have to work as a team to achieve this. The wing trimmer needs to adjust the wing to keep the boat supplied with the right amount of power to keep us flying — and we need to be in constant communication to get this right. My job is to control the foils when we are straight-line sailing. The rudders help keep the boat flying but the real power needed to keep it in the air comes from the two sets of hydrofoils that are located further forward. I can adjust the rake using the hydraulic power generated by the four guys on the grinders, which is where world-class athleticism is required. By changing the rake I change the angle of the foil as it goes through the water and this alters the amount of lift that the foil creates — and even the direction upwards or downwards. I need to adjust the board rake to get the right amount of lift to keep the ride height stable enough to fly through lifts, headers, puffs and lulls. When we are straight-line sailing these adjustments are often tiny and measured in fractions of degrees. The rest of the crew join in when we come to the corners. The challenge is to transfer the momentum of the boat from one foil to the other at full speed, while turning through 70 or 80 degrees — a bit like a skier turning a corner. When we are locked in and going straight the weight is on the two uphill edges, which gives us some sense of security. The tricky part in the turn is to transfer the weight on to the new edges at speed. When it comes to a tack or gybe, six guys are needed to co-ordinate the process. In a gybe, the wing trimmer moves first and starts to cross the boat. I begin the turn as the wing trimmer arrives on the new side and takes the new sheet. The trimmer then has to drop the new board and it’s crucial that it touches down at the right angle to provide the right amount of lift without destabilising the boat’s motion. I start crossing the boat while the wing trimmer steers through the remainder of the gybe and adjusts the new board rake to maintain stable flight through the turn. The grinder then lifts the old board as we accelerate out of the gybe and settle on the new angle. Once across the boat, I take the new wheel and resume control of direction and board rake. This releases the trimmer, who is the last to cross. The four guys at the front grind like crazy to restore the hydraulic power we’ve used in the turn, ready for the next adjustment. In a tack, the challenge is multiplied by the need to maintain enough speed to keep foiling as the boat is turned into the wind and motive force is lost — pulling this off is as difficult as it is to achieve a reach-to-reach gybe in 25 knots in the old America’s Cup monohulls. So if anyone tells you those at the front are just winding handles — tell them otherwise!